Shamsea is 17 years old and came to Hagar in 2017. 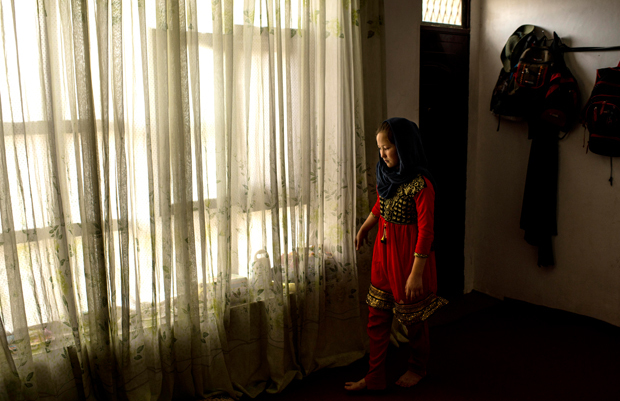 She came from a difficult family background in a rural province of Afghanistan. Growing up, Shamsea was often neglected. Her mother passed away from cancer, her father decided not to seek treatment for her, and paid very little attention to Shamsea. When she was about 13 years old, she was sold in marriage to a cousin with mental health problems. Shamsea didn’t want to marry him, but had no choice, and without any ceremony or legal process, she was sent away to live with the family of her new husband. There, she faced frequent physical and verbal abuse. She endured this situation for two years, during which time she knew nothing about her own family’s or sister’s whereabouts. She was never able to visit them or be visited. Shamsea eventually decided to run away and come to Kabul. While in another shelter, she was able to obtain a legal divorce, and when that temporary shelter could no longer care for her, she was referred by the Ministry of Women’s Affairs to Hagar. When she came, she cried frequently and was not able to think about her future at all. Counselling at Hagar’s Transitional Care Centre (TCC) was deeply significant in her journey to healing. When she realized that she was not alone, and that with support, she could begin a new life, she began to feel hope again. Shamsea was enrolled in accelerated education and started to learn tailoring skills. She was found to have some health issues related to her thyroid which requires long-term treatment, and she is now receiving the medication she needs. Hagar began the reintegration process for her, including trying to locate her family. Seven months of mediation was required before it was determined that her family would be safe.